Dentures are removable appliances that can replace some or all missing	teeth. Dentures are used to help restore your smile as well as chewing	functions. If you’ve lost all or some your natural teeth, whether	from gum disease, tooth decay or injury, replacing missing teeth will	benefit your appearance and your health. That’s because dentures make	it easier to eat and speak better than you could without teeth—things	that people often take for granted. When you lose all of your teeth, facial muscles can sag, making you look	older. 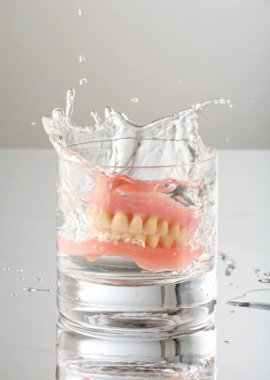 Dentures can help fill out the appearance of your face and profile. They can be made to closely resemble your natural teeth so that your appearance	does not change much. Dentures may even improve the look of your smile. Partial Denture: This partial removeable denture is for patients missing only some of their	teeth. This can be made out of cast metal or valplast [plastic] material. The partial dentures can also be used as a temporary prosthesis before	implant or bridge placement. Conventional: This full removable denture is made and placed in your mouth after the	remaining teeth are removed and tissues have healed, which may take several months. Immediate: This removable denture is inserted on the same day that the remaining	teeth are removed. Before the removal of remaining teeth, we will take	measurements and make models of your jaw during a preliminary visit. You	don’t have to be without teeth during the healing period, but may	need to have the denture relined or remade after your jaw has healed to	ensure ideal fit. *** Implant Overdenture ***: This is the gold standard in denture treamtent. Implants are placed in	the bone to help support the denture. New dentures may feel awkward for a few weeks until you become accustomed	to them. The dentures may feel loose while the muscles of your cheek and	tongue learn to keep them in place. It is not unusual to experience minor	irritation or soreness. You may find that saliva flow temporarily increases. As your mouth becomes accustomed to the dentures, these problems should	go away. Typically, few follow-up appointments are generally needed after	a denture is inserted so the fit can be checked and adjusted. Even if you wear full dentures, you still have to maintain good oral hygiene. Brush your gums, tongue and roof of your mouth every morning with a soft-bristled	brush before you insert your dentures to stimulate circulation in your	tissues and help remove plaque. Typically denture wearers use adhesives. Adhesives come in many forms:	creams, powders, pads/wafers, strips or liquids. If you use one of these	products, read the instructions, and use them exactly as directed. We	can recommend appropriate cleansers and adhesives.